The dynamic duo at more innocent pursuits. 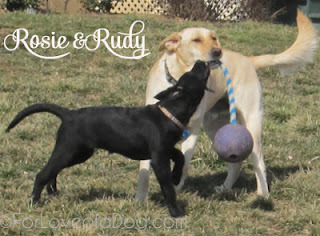 Rudy and Rosie are quite a team... especially when they're hunting voles. I managed to get some video footage of one of their vole expeditions a few weeks ago. Please excuse the shaky camera work. Not only was I trying not to laugh, I had Jeffie nudging me over and over. He knew Rudy and Rosie were not supposed to be doing that! In fact, what cracks me up the most in this video, is Rudy. Both he and Rosie are aware of me and the camera. However, Rudy also knows that messing around with critters and digging holes in the yard is a big no-no. In the end, good boy Rudy, can't bear it any longer and runs to mama! Yes, they really did have a vole they were "playing" with. Thankfully, they did not eat it. Here's the latest addition to our YouTube channel. Lol! That is so funny. The look on Rudy's face is priceless! So funny...poor Rudy - torn between the fun of vole hunting and the potential repercussions of making mom unhappy. Glad you won out in the end. LOL I love it! Did they actually have one? Looks like they were picking it up in their mouth! Thanks for the Monday giggles! They are so adorable! Torn between fun and obedience to a higher power that wields the food. I love it. The plight of the dog everywhere. Oh so cute!! I wouldn't want to be caught hunting voles! That face is priceless. Oh, too funny. Love how the tension builds with the music! Rudy's little face is too cute! LOL awww that's so cute! He just keeps staring at you! That is too funny - great hunting Rosie! that is so cute! I'm with Gizmo...I like how Rudy kept his eyes on YOU as if to say "I can't believe you are allowing Rosie to do this!!!" Rosie had that devil may care attitude, while Rudy looked like he was expecting you to put the kibash on their fun. At least one of them looked really guilty....lol.